I'm back with another card for the April Some Odd Girl Release! Today it's the gorgeous set Hop Hop Hooray! I wanted to keep this card super simple, to make the bunny the star of the show. 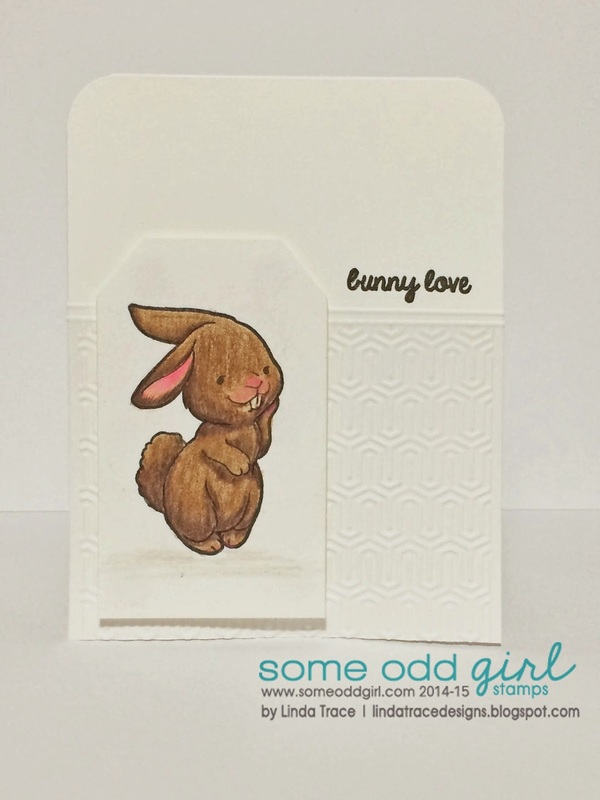 For this bunny (who is just so cute!) I coloured him in with Prismacolour Pencils (I made sure to make his nose and 'cheeks' extra pink, as though he's blushing at the thought of his 'bunny love' :). The embossing folder I used for the card base is from Lifestyle Crafts. The new sets Bunny Girl Gwen, and Hop Hop Hooray, are now available to purchase in the store! Pssst make sure you check out the new sequins too! After you've finished checking out the other projects, don't forget to sign up for our Newsletter, or take a look at our Facebook Group! We'd love it if you joined!